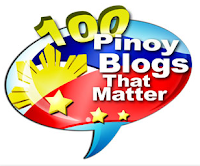 SEA Games 2015 Final Medal Tally ranks Team Philippines in 6th Place over-all. The 28th Southeast Asian Games or SEA Games 2015 in Singapore has come it to its last and final day, June 16, 2015, when games have all ended, and when the Closing Ceremony is taking place. 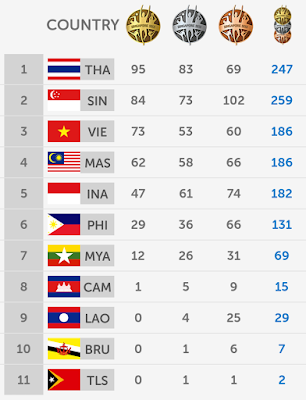 And the final over-all results make Thailand the over-all SEA Games champion again as it tops the standing with its gold medal haul of 95 plus 83 silver medals and 69 bronzes (last 2 golds were won in Badminton Women's Singles and Volleyball Men just this morning). The Thai team however fell short of its 2013 medals: 107 gold, 94 silver and 81 bronze. Please take note though that in 2013, there were a total of more than 1,500 medals at stake as against 1,300+ this 2015. Settling for 3rd is Vietnam with medal count of 73G, 53S, 60B, last gold was from Taekwondo Women's Under 62kg. In 2013, they also ranked 3rd in the standings with 74-85-86. Team Malaysia is in 4th Place, switching places with Team Indonesia, who grabbed that spot in 2013. Malaysia finished with 62G, 58S, 66B (last 2 golds won today: Badminton Men's Singles & Women's Doubles), while Indonesia, dropped to 5th, with 47-61-74. (last 2 gold also won today: Badminton Men's Doubles and Mixed Doubles). During 2013 SEA Games, Indonesia was 4th with 65-84-111, while Malaysia ranked 5th with 43-38-77. If not of Gilas Cadet's gold medal finish last night, the Philippine team would have finished short of 1 gold medal from 2013. 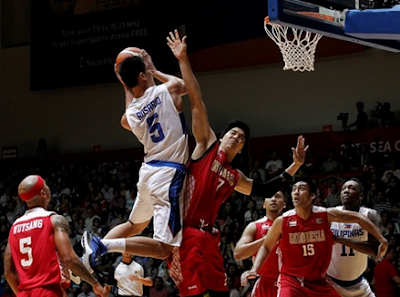 Thank you for that Gilas Cadets, for winning 3rd straight gold for the Philippines in SEA Games Men's Basketball. Among top performers for the Philippine men's basketball team in all their 5 games were Troy Rosario (16.0 PPG, 8.6 RPG), Almond Vosotros (14.0 PPG, 2.4 RPG), Kiefer Ravena (12.0 PPG, 2.4 RPG), Mac Belo (10.6 PPG, 4.2 RPG), Marcus Douthit (6.25 PPG, 7.75 RPG) and Norbert Torres (5.6 PPG, 5.4 RPG). Ranking in the Bottom 5 at 2015 SEA Games are 2013's 2nd Placer Myanmar (now just 7th), Cambodia (from 9th in 2013 to 8th this 2015), Laos (from 9th to 8th), Brunei Darussalam (11th to 10th) and Timor-Leste (10th to 11th). Meanwhile, among athletes who won multiple medals were Singaporean siblings Quah Ting Wen (8) and Quah Zheng Wen (12), Vietnam's Thi Anh Vien Nguyen (10), Singapore's Joseph Schooling (9) and Mohamad Faizal MD Saad (6), Malaysia's Hadi Farah Ann Abdul (6) and Philippines' Jasmine Alkhaldi (6).